This American Goldfinch (Carduelis tristis) spotted at our bird feeder in Renton, WA, is molting--> his feathers changing from winter colors into his breeding colors. 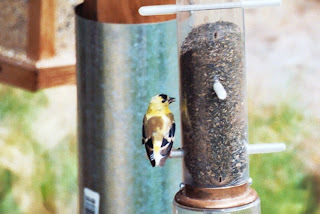 Goldfinches like thistle seed and will come to a feeder than has thistle in it. They eat from very tiny slots. Most thistle feeders are squirrel proof because of the narrow slot. A metal tube placed around a bird feeder pole will also prevent squirrels from climbing up the post to get at a bird feeder. The male of the American Gold Finch has the black cap on the head, the female does not. Most finches have an undulating, bobbing flight pattern, up down up down.